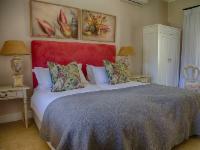 Auberge Clermont offers luxurious accommodation in the beautiful Franschhoek valley. This historic wine and fruit farm is synonymous with peace and is a favourite destination for the discerning traveller who enjoys an understated charm. The guest house, decorated in the colours and moods of Provence, comprises five stylish rooms and a gorgeous honeymoon suite, and has a small communal pool for those hot summer days. There is also self-catering accommodation available in the original farmhouse which can accommodate six adults comfortably. It has a fully equipped kitchen, lounge and three bedrooms with three bathrooms as well as a private pool. Underfloor heating, air-conditioning and ceiling fans ensure year-round comfort. Choose to dine under the 18th century oak trees, or in the courtyard dining room, while enjoying generous and delicious homemade country breakfasts. Take a dip in the sparkling pool overlooking the plum orchards, go for a leisurely walk through the vines and along the oak-lined river or the more energetic might enjoy a game of tennis on the court. The quaint village of Franschhoek, with its bustling high street of shops and world class restaurants, is only 5 minutes away. The fully equipped Villa has three bedrooms and three bathrooms and can accommodate 6 adults comfortably. Minimum stay of 2 nights and a maximum group of 6 people. "We had a great experience - very happy :)"
"An absolutely exquisite guesthouse, with matching surroundings. We were upgraded to the honeymoon suite, and as we now intend to make the "Clermont" our venue of choice whenever we manage to get away to Franschoek, we now have no choice but to upgrade ourselves next time! The comfort of the room, the beauty and tranquility of the grounds - the walks, the plunge pool - the team of Pauline and Jane all made it an absolutely wonderful stay. And although we could only get away for one night, it still served as the perfect refresher!" "We thoroughly enjoyed our stay, beautiful location and caring staff." Take the N1 in the direction of Paarl. Take the exit 47 (Approximately 47 km from Cape Town). Turn Right at the end of the off-ramp (R44) and continue to a 4-way stop. Go straight over and about 200m further; turn left towards Franschhoek. Travel along this road, past Boschendal, to the T-junction. Turn right – this road (R45) leads you into the main road of Franschhoek. At the far end of the town there is a T-junciton in front of the Huguenot Memorial - turn right here, then take the first right onto Robertsvlei Road. Auberge Clermont is the first farm on the left. S33° 55' 11.12" E19° 06' 53.95"